Tank.io APK 1.2.2 is a simple game where you can go to war in two-dimension world from your smartphone. This game is listed under arcade category on Google Play. In app purchases is not incorporated in this game, so that you can play it freely without having to purchase privilege. TapTo is a famous game developer who creates this game along with other similar arcade game such as crawl.io. There is nothing fancy on the graphic. It has simple graphic without using any complicated details. It only uses grid on black background with plenty of small shapes scattered over the grid including square, pentagon, and hexagon. The arcade game brings you to a virtual world where you have to play as small red circle. At the beginning, this circle is only equipped with a single barrel. You can point it to certain shape around the map. The experience you gain from shooting those shape will allow you to upgrade your tank. Upgrading tank can be done by improving your health point, speed, or more barrels. As you gain to next level, your tank will be more powerful. However, the gameplay is not that simple. Other players are using the same map as yours. In this condition, you should either defend your tank or attack them. Defeating other player’s tank gives you more experience. Since the gameplay is simple, it does not integrate to Google Play Games. You can only save your game on your device. Therefore, playing this game in other device requires different account. Despite the simple graphic and gameplay, several users who play this game say that it is challenging and addicting. Do not underestimate your enemy while playing with this game. They might be able to defeat you in a single swipe. 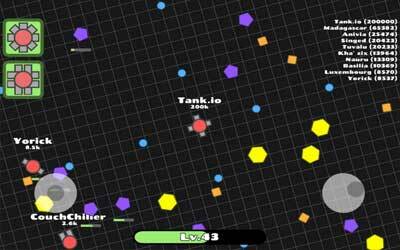 Tank.io for Android is recommended for users who want to kill some time by playing simple arcade game. Tankio is a tank battle arena. 52 different kinds of tanks so far, more to come.